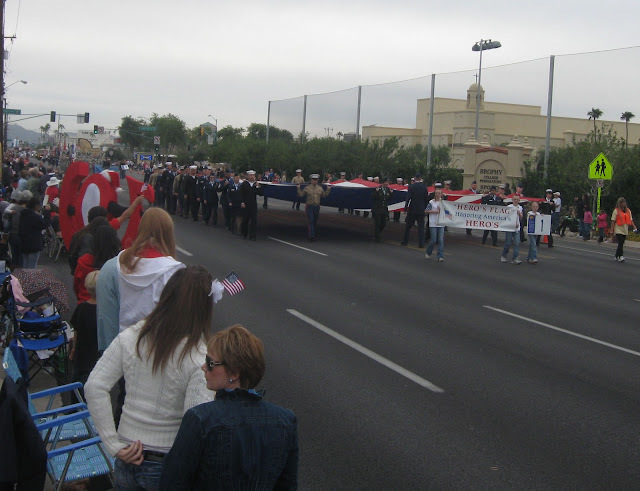 Phoenix Veterans Day Parade - 11/11/11. 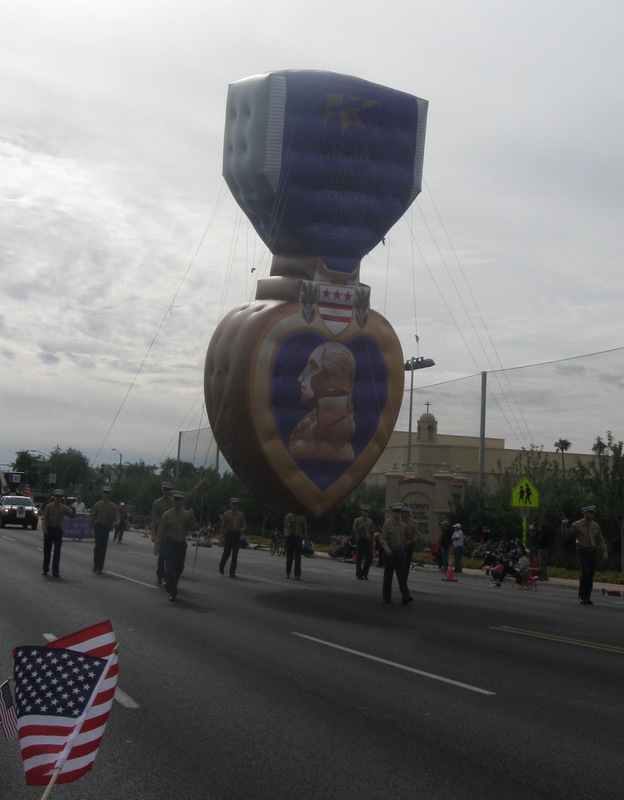 Although it got off to a shaky start (notice the misspelling, twice, of the word 'Hero's' on the banner), the parade immediately recovered its dignity and continued from there with great aplomb. I’m not sure I could tell you the last time I went to a big parade, but I’m sure it’s been ten years at least, maybe fifteen. Parades are not really my thing, for two primary reasons. For one thing, I don’t like crowds. I don’t know what it is, but parades just seem to attract them. Whenever I’m in a crowd, I quickly get very uptight and anxious. It’s nothing personal against the rest of humanity; it’s just that so many things can go wrong when you have to stand next to folks you don’t know for longer than a standard elevator ride or forty-two seconds, whichever comes first. Whenever I find myself in that kind of situation, I focus on all the mishaps that could occur, ranging from personal embarrassment to outright calamity, and then spend whatever time remains combining them in imaginative and unusual ways. 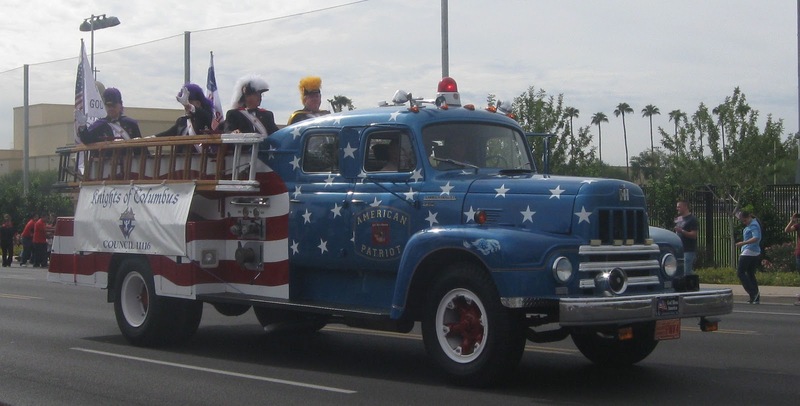 The other reason is that parades are usually connected to a holiday, and I have always looked at holidays as precious and fleeting gifts of freedom from the rat race. Thus, I tend to jealously guard these days much the way a dragon guards its treasure, specifically a dragon that’s down to its last few pieces of gold because some thief has absconded with the rest. Holidays, especially the paid ones, engender a feeling similar to the one you get when the tax refund finally shows up in your bank account: even though you knew it was coming, you can’t help but get a little giddy anyway. Putting myself in a situation where I would feel uncomfortable, such as a parade, for instance, has always struck me as an extremely non-giddy way to spend a holiday. 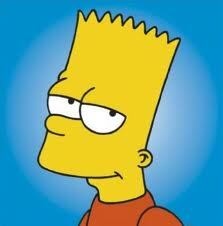 However, things have changed drastically for me this year. I’m a newly-minted freelance writer, which means I’m out of the rat race, because let’s face it, even rats don’t race for free, like I happen to be doing now. One of the positive side effects, however, has been that I no longer feel a need to protect every spare moment that comes my way as though it were the last remaining seat in a death-match version of musical chairs. So, on November 11th, 2011, we took the plunge. We gathered up the kids, and went downtown to watch the VA Veterans Day Parade. Many people don’t realize this, but Phoenix’s Veterans Day parade is one of the largest in the country. 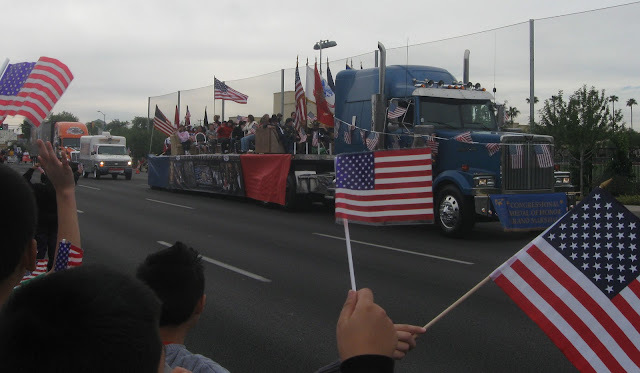 I know we were surprised by how big a parade it actually is. Looking at the program, handed out by scurrying troops of freshly-scrubbed Scouts before the start, we saw that there were a total of 49 groups participating. We were duly impressed by that, until our daughter alerted us to the fact that there were another two pages of entrants, bringing the total to 105. The parade itself ran a very solid two hours. Before we left the house, I heard the local news estimate thirty to forty thousand spectators would attend this year’s event. Two hours in, I thought that was the number of people in the parade. It’s a long parade, and it feels even longer when you spend the majority of the time preventing a frisky two-year-old from running into the tangle of marching legs, especially when the pretty horseys and the friendly doggies are passing by. Fortunately for us, my daughter was eventually overwhelmed by all the excitement and fell asleep. For the last half-hour, my wife and I alternated holding her slag-like body in our arms while doing our best to continue waving and clapping and cheering. The VA Veterans parade had all the things that make parades the joyous and nerve-wracking (maybe that’s just me) experiences they are: bands, floats, giant balloons, dignitaries, celebrities, great old restored cars like Ford Model T’s and convertible Caddies, big trucks and military vehicles of all shapes and sizes, really loud motorcycles, music, flags, baton twirlers, and, of course, crowds. Well, now he's done it all. Saying thank you was what it was all about. There was a group to our right who, without fail, showered every veteran before them with a sincere and vociferous bouquet of “Thank you’s!” On our left, a group of kids squeezed in, one of them bearing a homemade sign that said “Thank You!” in bold, brightly colored letters. It was amazing the reaction that simple sign got from the people in the parade. I watched as veteran after veteran noticed the sign, and the kids holding it, and then saw an expression of deep appreciation and genuine gratitude come to their faces. 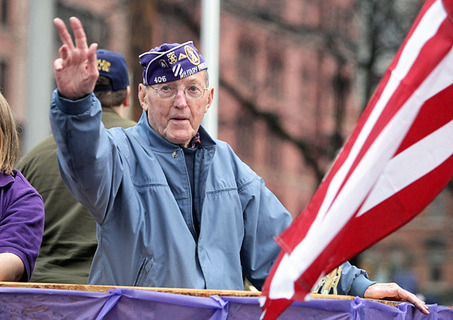 Some of the veterans would point at them and smile, some would give them an enthusiastic thumbs up, some would say “You’re welcome,” or “Thank you,” and for some it was just the expression. I don’t know if the kids realized how much their sign meant to many of those grizzled veterans, but I did. It was obvious they appreciated the extra effort. In fact, there were a few times during the parade when I received somewhat similar looks from a few honored servicemen and women, by which I was initially baffled. 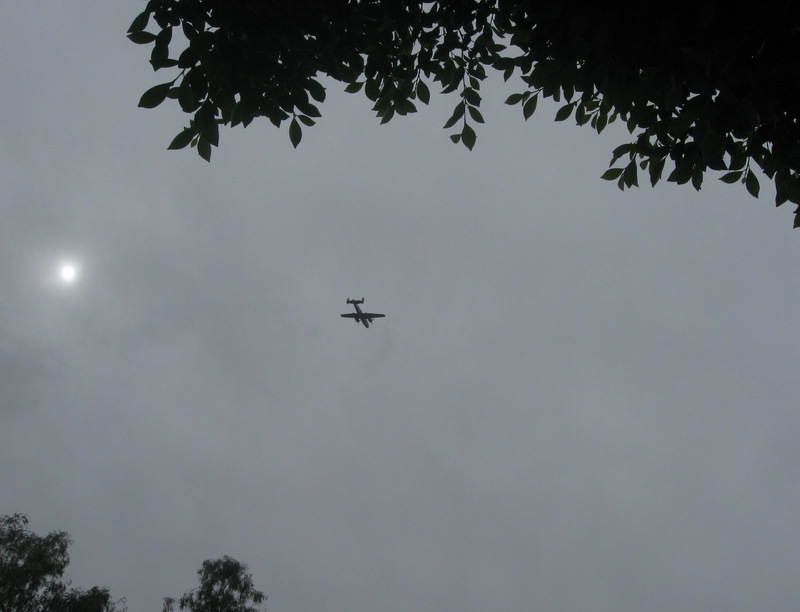 It only happened a handful of times, but occasionally my eyes would meet a veteran’s, and a kind of instant communication passed between us. It went beyond the standard expression of benevolent regard or polite reciprocation. It wasn’t a typical “Thanks for being here,” or “Thanks for the support” kind of a look; it was a deeper, more purposeful transmission than that, the sort of look you struggle to describe, but that you instantly recognize as significant when you see it. For the life of me I couldn’t understand why. Why were they looking at me that way? Did they somehow confuse me as being with the group of kids next to us? No, it was something else, something intentional. At some point during the parade, I think I figured it out. I think it had to do with our kids. Our two daughters were out in front of us, ten and two years old, waving and cheering the veterans as they passed. I think the looks I received from those veterans were thanking me for bringing our daughters to the parade. I think they were trying to express, with nothing more than a prolonged glance, a sincere gratitude for passing on to our girls a tradition of respect and appreciation for our soldiers, for teaching them how to show civic pride in those who had served, and show honor for the sacrifices all soldiers make. I believe that was the gist of what those looks meant. I can tell you that it will be a long time before I forget them. To be honest, it made me feel a little selfish for having waited so long to bring them to see the parade. I felt a little like someone who was taking credit for doing something good which I had actually chosen to do almost on a lark. After the parade was over, we headed out to the Veteran’s Memorial Cemetery to visit the graves of my wife’s parents. Her father had served in the army during WWII, ending the war as a paratrooper with the 101st Airborne Division. He would tell stories about the French countryside, and trading cigarettes for wine, and little things like that, but nothing more. He was a quiet man, as I suspect many soldiers were, and are. He belonged to the American Legion and the VFW, but never went to meetings, and was never comfortable talking about the war part of being a soldier. He never marched in a veterans’ parade, except for once in New York, a victory parade down 5th Avenue after his unit returned to the States. He did like to talk about that. My father is a veteran too, who served stateside during the time of the Cuban Missile Crisis. He was stationed in Illinois, and speaks most fondly of the liberty passes he got while he was in the service, the ones he used to visit his girl, my mom, in Wisconsin. To those that were in the parade, thanks once again, and we look forward to seeing you next year. This time, we’ll bring a sign. 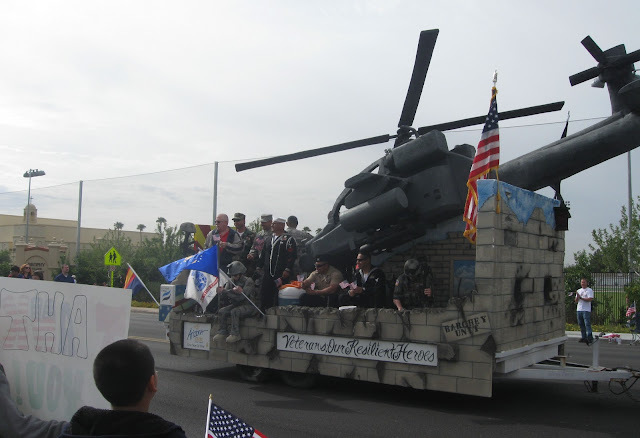 Apache helicopter mock-up float. Best float by far! 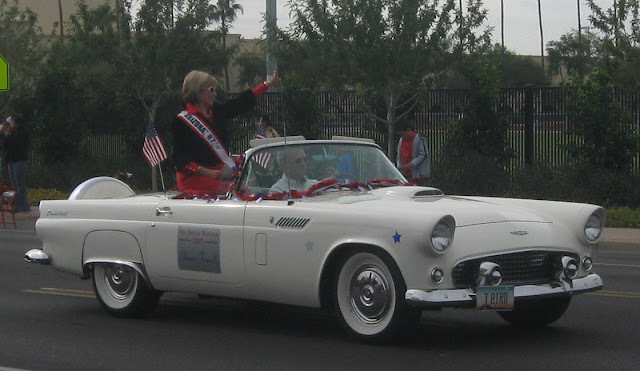 Same float, different angle. Great job guys! 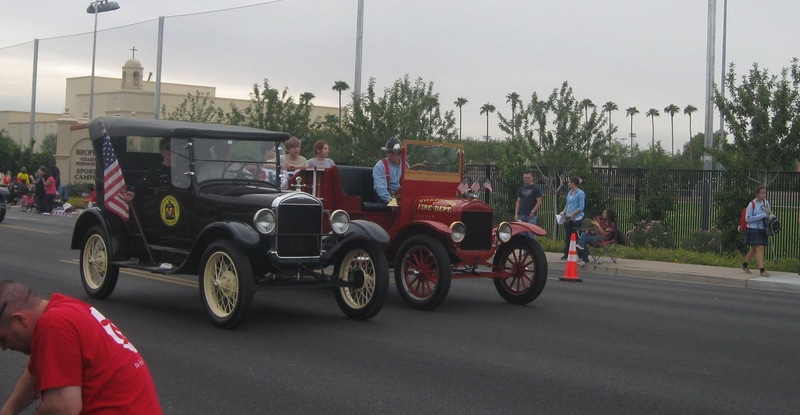 Although many people don't realize it, drag racing goes back to the days of the Model T. Spectators were treated to a recreation of this thrilling pastime at the Veterans Day parade in Phoenix. Unfortunately, both were beaten badly by the girl walking home from Xavier High School (sidewalk, far right side of picture). The purple heart is given to those injured or killed in battle. 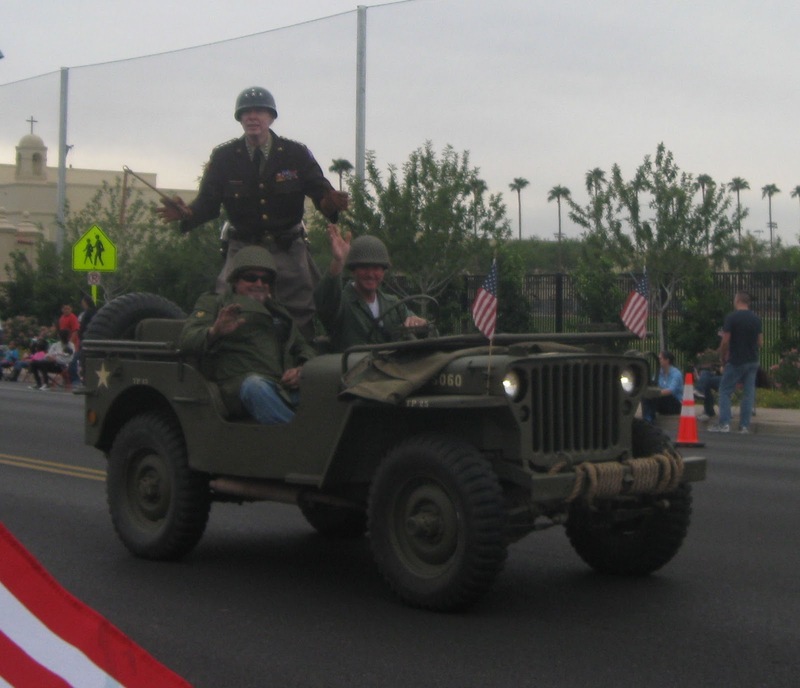 The man sitting behind the wheel of his Jeep is Jeff "M1" Abrahamson, a good friend of ours. As you can see from this photo, having General Patton directly behind him yelling orders does not phase him in the least. Good job of basic training, Robin! I must ask though, considering your's and your wife's tendency towards rivalry, is there any signifigance to the fact that you are set up across from Brophy? Hutton: Thanks! The significance of where we set up for the parade had more to do with the fact that I used to work in the building on the east side of seventh street, and knew how to sneak into the parking lot via the back way!